Happy New year to all my readers!! Year 2015 was a decent year for my blog. Even though the number of post was less, I was able to post some of my favorite recipes on the blog. Quality matters than quantity. Do you agree with me? Each year I begin with some sort of resolutions and end with not completing at least some of them. So this year I am not jumping into the gun with resolutions, I am going to take it as it comes along. I love baking and it’s inevitable in my life, so I like to start this year with a sweet note by a simple fruit and nut Biscotti. 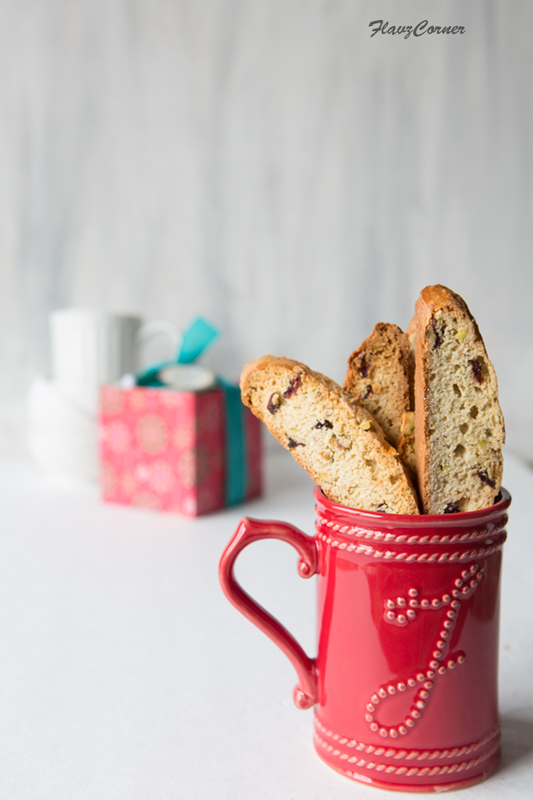 Biscotti have its Italian origin and are believed to be originated in the city of Prato. "Biscotti" is the plural form of Biscotto. The word Biscotti shares its origin from English word biscuit which is twice-baked. The original Biscotti were Italian almond biscuits. They are twice-baked, oblong-shaped, dry and crunchy toast kind of snack which is served with drinks. Modern variations have taken Biscotti to another level and we can see all different kinds and flavors of Biscotti in the market today. An Indian version of Biscotti is plain without any fruits and nuts and they are called Rusk and they are served with tea or coffee. Rusk is usually prepared with all purpose flour or wheat flour. The Greek version of Biscotti is called Paximadi which is a form of Rusk and it’s made from barley or chickpea flour and softened with wine, water or oil before eating. In Cuba, it’s made out of yellow cake batter and baked twice and served with Cuban coffee. There are several international versions of the Biscotti and they are named differently. 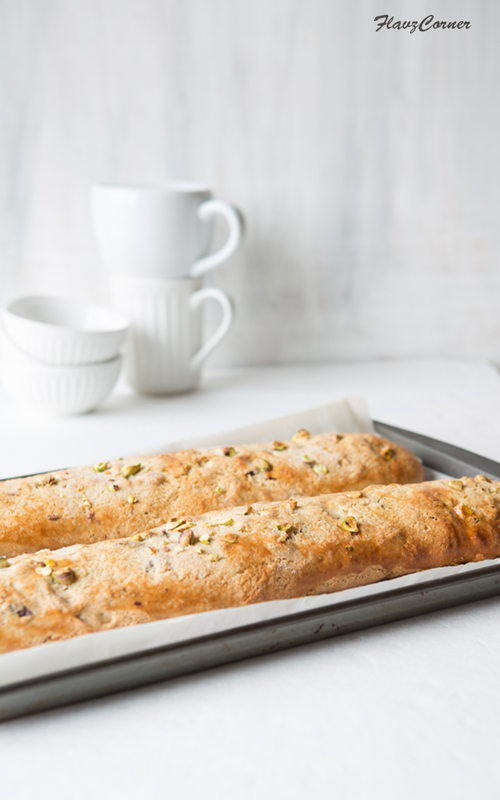 The Pistachio and Cranberry Biscotti are my kids' favorite, so I assure you that it will become your family favorite too. Give this recipe a try and let me know how it turns out for you. Preheat oven to 375°F. Line a baking sheet with Parchment paper and keep it aside. 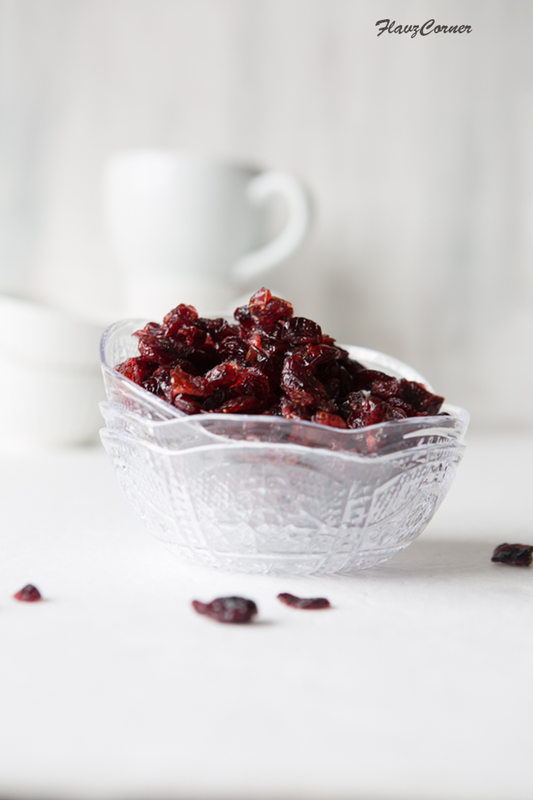 Soak 1/2 of dried cranberries in 1/2 cup boiling water for 15 minutes. Drain and keep it aside. Sift flour, baking powder and salt together into a bowl. Mix the butter,3 eggs minus the egg white of one, sugar and vanilla in a mixing bowl using a paddle attachment of the stand mixer. Add sifted flour mixture and combine them till a slightly sticky dough is formed. Mix in cranberries and pistachios. Divide the dough into two balls and place them on a flour dusted surface. Use generous amount of flour to roll them into two 16 x 2'' logs. Flatten the tops and stud the tops of the logs with 1 tsp of chopped pistachios. Brush the top of the logs with reserved beaten egg white. Sprinkle 1 tsp of sugar on top of the logs and transfer them to a parchment lined baking sheet. Bake them for 25 minutes or till the top looks golden yellow. Transfer the logs to a wire rack and cool for 20 minutes. Reduce the oven temperature to 300°F. Use a serrated knife to cut the logs slightly diagonal into 1/2 inch thick pieces. Place a wire rack on the baking sheet and arrange the sliced pieces with cut side down and bake until firm for 30 minutes. You may have to do the double baking in batches or 2 baking sheets at a time. If using 2 baking sheets, rotate the sheets at half the cooking time. Let the Biscotti cool completely on the wire rack before transferring to a air tight container. Biscotti can be store in air tight container at room temperature for upto 1 week. I love those Italian classic! 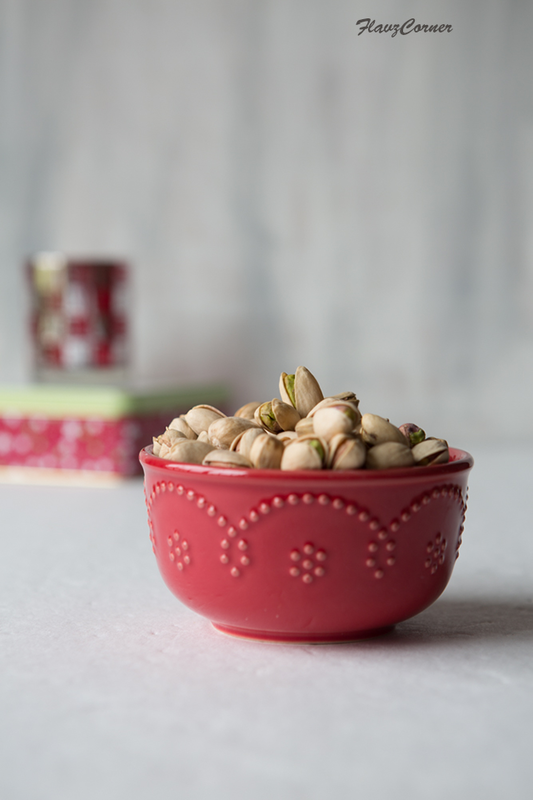 Pistachio and cranberry are a dream team, ain't they? Happy New Year! I agree with Angie -- pistachio and cranberry really combine so well. This looks amazing -- thanks so much. Biscotti look perfect. I simply love pistachios, I can imagine this is yummm!! 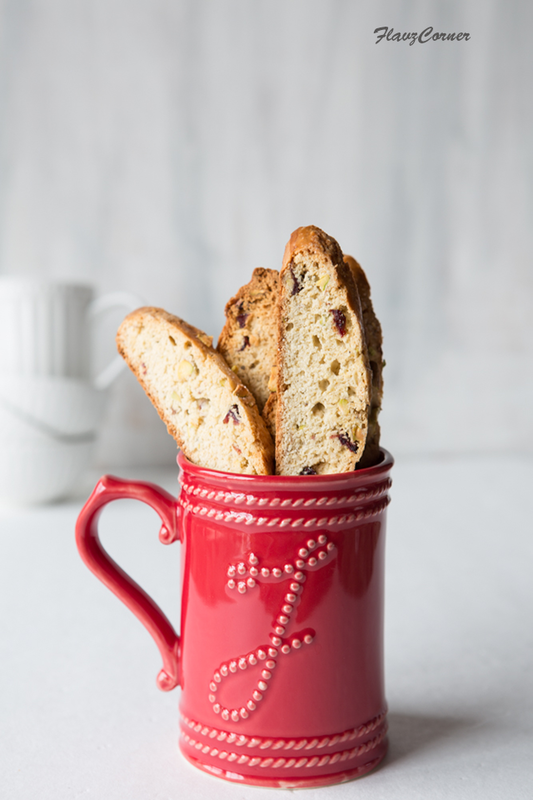 Biscotti is an amazing cookie and this one is so classic and perfect. They are a match made in cookie heaven. Looks beautiful Shibi and Hope you are having a wonderful week so far. Happy New Year Shibi. 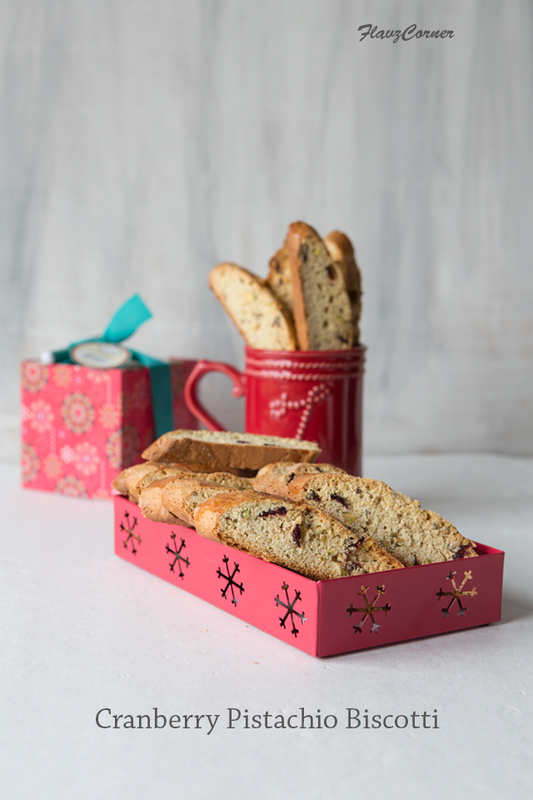 The biscotti looks perfect and crisp to perfection.